This is “Motivating Employees Through Goal Setting”, section 6.2 from the book An Introduction to Organizational Behavior (v. 1.0). For details on it (including licensing), click here. Identify characteristics of a goal that make it effective. Understand how to tie individual goals to strategic goals. Goal-setting theoryLocke, E. A., & Latham, G. P. (1990). A theory of goal setting & task performance. Englewood Cliffs, NJ: Prentice Hall. is one of the most influential and practical theories of motivation. In fact, in a survey of organizational behavior scholars, it has been rated as the most important (out of 73 theories).Miner, J. B. (2003). The rated importance, scientific validity, and practical usefulness of organizational behavior theories. Academy of Management Learning and Education, 2, 250–268. The theory has been supported in over 1,000 studies with employees ranging from blue-collar workers to research-and-development employees, and there is strong support that setting goals is related to performance improvements.Ivancevich, J. M., & McMahon, J. T. (1982). The effects of goal setting, external feedback, and self-generated feedback on outcome variables: A field experiment. Academy of Management Journal, 25, 359–372; Latham, G. P., & Locke, E. A. (2006). Enhancing the benefits and overcoming the pitfalls of goal setting. Organizational Dynamics, 35, 332–340; Umstot, D. D., Bell, C. H., & Mitchell, T. R. (1976). Effects of job enrichment and task goals on satisfaction and productivity: Implications for job design. Journal of Applied Psychology, 61, 379–394. According to one estimate, goal setting improves performance at least 10%–25%.Pritchard, R. D., Roth, P. L., Jones, S. D., Galgay, P. J., & Watson, M. D. (1988). Designing a goal-setting system to enhance performance: A practical guide. Organizational Dynamics, 17, 69–78. Based on this evidence, thousands of companies around the world are using goal setting in some form, including Coca Cola Company, PricewaterhouseCoopers International Ltd., Nike Inc., Intel Corporation, and Microsoft Corporation, to name a few. SMART goals help people achieve results. Are you motivated simply because you have set a goal? The mere presence of a goal does not motivate individuals. Think about New Year’s resolutions that you made but failed to keep. Maybe you decided that you should lose some weight but then never put a concrete plan in action. Maybe you decided that you would read more but didn’t. Why did your goal fail? Accumulating research evidence indicates that effective goals are SMART. A SMART goalA goal that is specific, measurable, aggressive, realistic, and time-bound. is a goal that is specific, measurable, aggressive, realistic, and time-bound. Effective goals are specific and measurable. For example, “increasing sales to a region by 10%” is a specific goal, whereas deciding to “delight customers” is not specific or measurable. When goals are specific, performance tends to be higher.Tubbs, M. E. (1986). Goal setting: A meta-analytic examination of the empirical evidence. Journal of Applied Psychology, 71, 474–483. Why? If goals are not specific and measurable, how would you know whether you have reached the goal? A wide distribution of performance levels could potentially be acceptable. For the same reason, “doing your best” is not an effective goal, because it is not measurable and does not give you a specific target. Certain aspects of performance are easier to quantify. For example, it is relatively easy to set specific goals for productivity, sales, number of defects, or turnover rates. However, not everything that is easy to measure should be measured. Moreover, some of the most important elements of someone’s performance may not be easily quantifiable (such as employee or customer satisfaction). So how do you set specific and measurable goals for these soft targets? Even though some effort will be involved, metrics such as satisfaction can and should be quantified. For example, you could design a survey for employees and customers to track satisfaction ratings from year to year. This may sound counterintuitive, but effective goals are difficult, not easy. Aggressive goals are also called stretch goals. According to a Hay Group study, one factor that distinguishes companies that are ranked as “Most Admired Companies” in Fortune magazine is that they set more difficult goals.Stein, N. (2000). Measuring people power. Fortune, 142(7), 186. People with difficult goals outperform those with easier goals.Mento, A. J., Steel, R. P., & Karren, R. J. (1987). A meta-analytic study of the effects of goal-setting on task performance: 1966–1984. Organizational Behavior and Human Decision Processes, 39, 52–83; Phillips, J. M., & Gully, S. M. (1997). Role of goal orientation, ability, need for achievement, and locus of control in the self-efficacy and goal-setting process. Journal of Applied Psychology, 82, 792–802; Tubbs, M. E. (1986). Goal setting: A meta-analytic examination of the empirical evidence. Journal of Applied Psychology, 71, 474–483; Yukl, G. A., & Latham, G. P. (1978). Interrelationships among employee participation, individual differences, goal difficulty, goal acceptance, goal instrumentality, and performance. Personnel Psychology, 31, 305–323. Why? Easy goals do not provide a challenge. When goals are aggressive and require people to work harder or smarter, performance tends to be dramatically higher. Research shows that people who have a high level of self-efficacy and people who have a high need for achievement tend to set more difficult goals for themselves.Phillips, J. M., & Gully, S. M. (1997). Role of goal orientation, ability, need for achievement, and locus of control in the self-efficacy and goal-setting process. While goals should be difficult, they should also be based in reality. In other words, if a goal is viewed as impossible to reach, it will not have any motivational value. In fact, setting impossible goals and then punishing people for not reaching these goals is cruel and will demotivate employees. The goal should contain a statement regarding when the proposed performance level will be reached. For example, “increasing sales to a region by 10%” is not a time-bound goal, because there is no time limit. Adding a limiter such as “by December of the current fiscal year” gives employees a sense of time urgency. Here is a sample SMART goal: Wal-Mart Stores Inc. recently set a goal to eliminate 25% of the solid waste from U.S. stores by the year 2009. This goal meets all the conditions of being SMART (as long as 25% is a difficult yet realistic goal).Heath, D., & Heath, C. (2008, February). Make goals not resolutions. Fast Company, 122, 58–59. Even though it seems like a simple concept, in reality many goals that are set within organizations may not be SMART. For example, Microsoft recently conducted an audit of its goal setting and performance review system and found that only about 40% of the goals were specific and measurable.Shaw, K. N. (2004). Changing the goal-setting process at Microsoft. Academy of Management Executive, 18, 139–142. 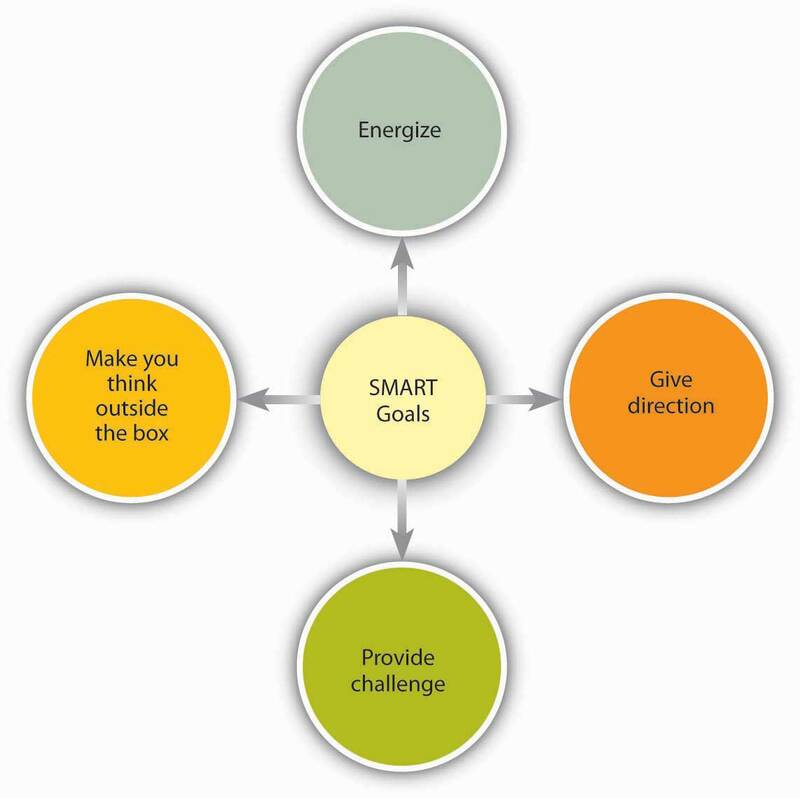 SMART goals motivate for a variety of reasons. Sources: Based on information contained in Latham, G. P. (2004). The motivational benefits of goal-setting. Academy of Management Executive, 18, 126–129; Seijts, G. H., & Latham, G. P. (2005). Learning versus performance goals: When should each be used? Academy of Management Executive, 19, 124–131; Shaw, K. N. (2004). Changing the goal-setting process at Microsoft. Academy of Management Executive, 18, 139–142. There are at least four reasons why goals motivate.Latham, G. P. (2004). The motivational benefits of goal-setting. Academy of Management Executive, 18, 126–129; Seijts, G. H., & Latham, G. P. (2005). Learning versus performance goals: When should each be used? Academy of Management Executive, 19, 124–131; Shaw, K. N. (2004). Changing the goal-setting process at Microsoft. Academy of Management Executive, 18, 139–142. First, goals give us direction. When you have a goal of reducing shipment of defective products by 5% by September, you know that you should direct your energy toward defects. The goal tells you what to focus on. For this reason, goals should be set carefully. Giving employees goals that are not aligned with company goals will be a problem, because goals will direct employees' energies to a certain end. Second, goals energize people and tell them not to stop until the goal is accomplished. If you set goals for yourself such as “I will have a break from reading this textbook when I finish reading this section,” you will not give up until you reach the end of the section. Even if you feel tired along the way, having this specific goal will urge you to move forward. Third, having a goal provides a challenge. When people have goals and proceed to reach them, they feel a sense of accomplishment. Finally, SMART goals urge people to think outside the box and rethink how they are working. If the goal is not very difficult, it only motivates people to work faster or longer. If a goal is substantially difficult, merely working faster or longer will not get you the results. Instead, you will need to rethink the way you usually work and devise a creative way of working. It has been argued that this method resulted in designers and engineers in Japan inventing the bullet train. Having a goal that went beyond the speed capabilities of traditional trains prevented engineers from making minor improvements and inspired them to come up with a radically different concept.Kerr, S., & Landauer, S. (2004). Using stretch goals to promote organizational effectiveness and personal growth: General Electric and Goldman Sachs. Academy of Management Executive, 18, 134–138. When Are Goals More Effective? Even when goals are SMART, they are not always equally effective. Sometimes, goal setting produces more dramatic effects compared to other methods. At least three conditions that contribute to effectiveness have been identified.Latham, G. P. (2004). The motivational benefits of goal-setting. Academy of Management Executive, 18, 126–129; Latham, G. P., & Locke, E. A. (2006). Enhancing the benefits and overcoming the pitfalls of goal setting. Organizational Dynamics, 35, 332–340. To be more effective, employees should receive feedback on the progress they are making toward goal accomplishment. Providing employees with quantitative figures about their sales, defects, or other metrics is useful for feedback purposes. Employees should have the skills, knowledge, and abilities to reach their goals. In fact, when employees are lacking the necessary abilities, setting specific outcome goals has been shown to lead to lower levels of performance.Seijts, G. H., & Latham, G. P. (2005). Learning versus performance goals: When should each be used? Academy of Management Executive, 19, 124–131. People are likely to feel helpless when they lack the abilities to reach a goal, and furthermore, having specific outcome goals prevents them from focusing on learning activities. In these situations, setting goals about learning may be a better idea. For example, instead of setting a goal related to increasing sales, the goal could be identifying three methods of getting better acquainted with customers. 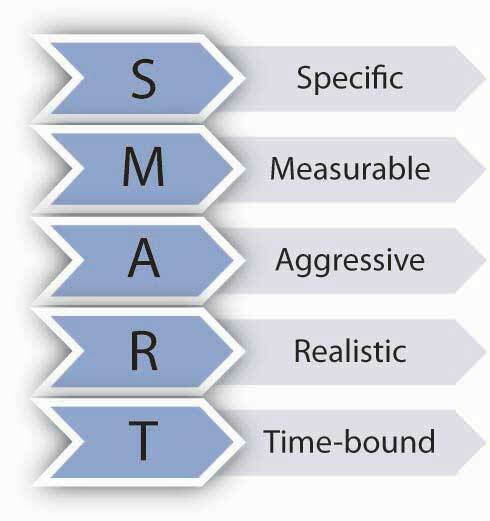 SMART goals are more likely to be effective if employees are committed to the goal.Donovan, J. J., & Radosevich, D. J. (1998). The moderating role of goal commitment on the goal difficulty-performance relationship: A meta-analytic review and critical reanalysis. Journal of Applied Psychology, 83, 308–315; Klein, H. J., Wesson. M. J., Hollenbeck, J. R., & Alge, B. J. (1999). Goal commitment and the goal-setting process: Conceptual clarification and empirical synthesis. Journal of Applied Psychology, 84, 885–896; Wofford, J. C., Goodwin, V. L., & Premack, S. (1993). Meta-analysis of the antecedents of personal goal level and of the antecedents and consequences of goal commitment. Journal of Management, 18, 595–615. As a testament to the importance of goal commitment, Microsoft actually calls employee goals “commitments.”Shaw, K. N. (2004). Changing the goal-setting process at Microsoft. Academy of Management Executive, 18, 139–142. Goal commitmentThe degree to which a person is dedicated to reaching the goal. refers to the degree to which a person is dedicated to reaching the goal. What makes people dedicated or committed to a goal? It has been proposed that making goals public may increase commitment to the goal, because it creates accountability to peers. When individuals have a supportive and trust-based relationship with managers, goal commitment tends to be higher. When employees participate in goal setting, goal commitment may be higher. Last, but not least, rewarding people for their goal accomplishment may increase commitment to future goals.Klein, H. J., & Kim, J. S. (1998). A field study of the influence of situational constraints, leader-member exchange, and goal commitment on performance. Academy of Management Journal, 41, 88–95; Latham, G. P. (2004). The motivational benefits of goal-setting. Academy of Management Executive, 18, 126–129; Pritchard, R. D., Roth, P. L., Jones, S. D., Galgay, P. J., & Watson, M. D. (1988). Designing a goal-setting system to enhance performance: A practical guide. Organizational Dynamics, 17, 69–78. Sources: Based on LePine, J. A. (2005). Adaptation of teams in response to unforeseen change: Effects of goal difficulty and team composition in terms of cognitive ability and goal orientation. Journal of Applied Psychology, 90, 1153–1167; Locke, E. A. (2004). Linking goals to monetary incentives. Academy of Management Executive, 18, 130–133; Pritchard, R. D., Roth, P. L., Jones, S. D., Galgay, P. J., & Watson, M. D. (1988). Designing a goal-setting system to enhance performance: A practical guide. Organizational Dynamics, 17, 69–78; Seijts, G. H., & Latham, G. P. (2005). Learning versus performance goals: When should each be used? Academy of Management Executive, 19, 124–131. As with any management technique, there may be some downsides to goal setting.Locke, E. A. (2004). Linking goals to monetary incentives. Academy of Management Executive, 18, 130–133; Pritchard, R. D., Roth, P. L., Jones, S. D., Galgay, P. J., & Watson, M. D. (1988). Designing a goal-setting system to enhance performance: A practical guide. Organizational Dynamics, 17, 69–78; Seijts, G. H., & Latham, G. P. (2005). Learning versus performance goals: When should each be used? Academy of Management Executive, 19, 124–131. First, as mentioned earlier, setting goals for specific outcomes may hamper employee performance if employees are lacking skills and abilities needed to reach the goals. In these situations, setting goals for behaviors and learning may be more effective than setting goals for outcomes. Second, goal setting may prevent employees from adapting and changing their behaviors in response to unforeseen threats. For example, one study found that when teams had difficult goals and employees within the team had high levels of performance expectations, teams had difficulty adapting to unforeseen circumstances.LePine, J. A. (2005). Adaptation of teams in response to unforeseen change: Effects of goal difficulty and team composition in terms of cognitive ability and goal orientation. Journal of Applied Psychology, 90, 1153–1167. Third, goals focus employee attention on the activities that are measured. This focus may lead to sacrificing other important elements of performance. If goals are set for production numbers, quality may suffer. As a result, it is important to set goals touching on all critical aspects of performance. Finally, an aggressive pursuit of goals may lead to unethical behaviors. If employees are rewarded for goal accomplishment but there are no rewards for coming very close to reaching the goal, employees may be tempted to cheat. A review of the literature shows that 68 out of the 70 studies conducted on this topic displayed performance gains as a result of MBO implementation.Rodgers, R., & Hunter, J. E. (1991). Impact of management by objectives on organizational productivity. Journal of Applied Psychology, 76, 322–336. It also seems that top management commitment to the process is the key to successful implementation of MBO programs.Rodgers, R., Hunter, J. E., & Rogers, D. L. (1993). Influence of top management commitment on management program success. Journal of Applied Psychology, 78, 151–155. Even though formal MBO programs have fallen out of favor since the 1980s, the idea of linking employee goals to corporate-wide goals is a powerful idea that benefits organizations. Goal-setting theory is one of the most influential theories of motivation. In order to motivate employees, goals should be SMART (specific, measurable, aggressive, realistic, and time-bound). SMART goals motivate employees because they energize behavior, give it direction, provide a challenge, force employees to think outside the box, and devise new and novel methods of performing. Goals are more effective in motivating employees when employees receive feedback on their accomplishments, have the ability to perform, and are committed to goals. 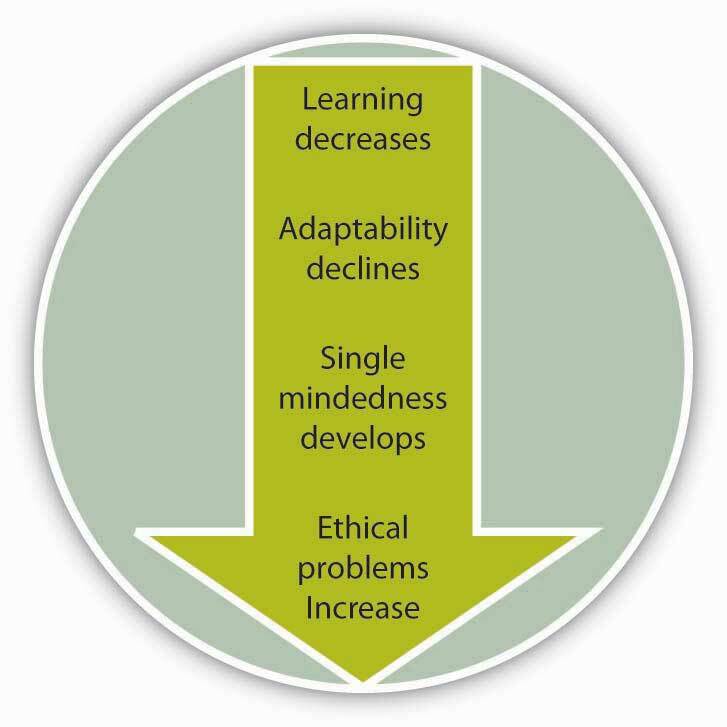 Poorly derived goals have the downsides of hampering learning, preventing adaptability, causing a single-minded pursuit of goals at the exclusion of other activities, and encouraging unethical behavior. Companies tie individual goals to company goals using management by objectives. Give an example of a SMART goal. How would you ensure that employees are committed to the goals set for them? A company is interested in increasing customer loyalty. Using the MBO approach, what would be the department- and individual-level goals supporting this organization-wide goal? Discuss an experience you have had with goals. Explain how goal setting affected motivation and performance.